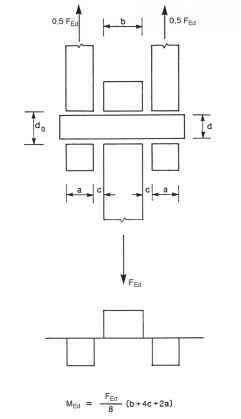 fu is the ultimate tensile strength of the steel on which the bolt bears; pb is the spacing of the bolt-rows in the direction of load transfer; tj is the thickness of that component. beff is the effective width of the T-stub flange, see 6.2.5(3) ; /eff is the effective length of the T-stub flange, see 6.2.5(3). Lb is the anchor bolt elongation length, taken as equal to the sum of 8 times the nominal bolt diameter, the grout layer, the plate thickness, the washer and half of the height of the nut.